I feel a touch awkward right now. It isn’t often that I promote a body of work here outside of my own stories. So I am going to hit you with a few things right off the bat. Christine Heppermann reviews young adult books for the Chicago Tribune. She also does a bit of writing. 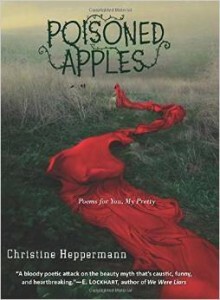 What I am focusing on right now is her book Poisoned Apples and the poem from that book “Big Bad Spa Treatment.” I ran across this book in my Young Adult literature class recently. Aside from the love of twisted fairy tales, this one has a decent number of interesting poems that are worth reading and exploring. While I was reading through the poems I found one that fits so perfectly into the themes that are represented here and I couldn’t pass up an opportunity to share it with everyone. Of course, this is a great quick reading book of poems that you should go check out. On a side note, Friday would normally be a night for a food or beer story of some sort maybe even a recipe, I think you will find this poem fits the mood properly. Be sure to check out the book and others from Christine Heppermann on Amazon. 6 Responses to "Poisoned Apples #NaPoWriMo"
This is very cool Jon. It’s just plain fun in wicked fun way. I’ll for check out the book. I just can’t see that one any other way. Well, maybe seductive, but my vamp voice is horrible. I am in awe of that book cover. Wicked it is.